I certainly did not need all of it for another week or so. 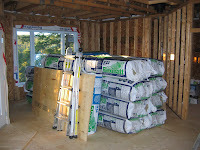 But in haste and wishing to keep the delivery operation simple I choose to receive all of the insulation order. 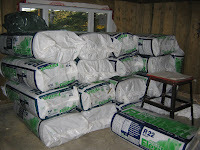 Not a big mistake but a very inconvenient one, as now I have to keep moving the bags of insulation - and we have a lot of them - from the areas I am working in. 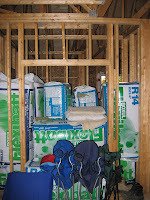 I have insulation in the master bedroom closet. And that is not the worst of it! I only received half of the insulation for the Ceiling. Fortunately, this part of the insulation order is on back order. I should receive it in about two weeks - just in time to install it. Take-away Message: When your building schedule gets stretched be sure to adjust the delivery schedule for your materials to compensate - or you could be swimming in materials you do not quite need yet.